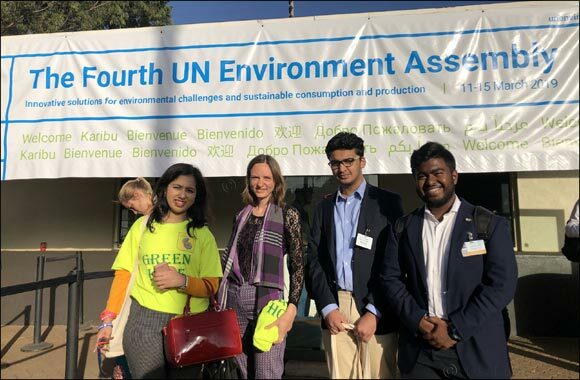 Dubai, UAE, March 20, 2019: A Green Hope youth delegation comprising of members from Dubai , Canada and Sweden made an indelible impact at the 4th session of the United Nations Environment Assembly ( UNEA ) which concluded in Nairobi on 15th March. The UNEA is the world's foremost event on environmental sustainability and was attended by ministerial delegations from 193 countries as well as hundreds of civil society stakeholders. It was an honor for Green Hope to be the youngest accredited organisation at this year's UNEA . Green Hope delegates gave substantive inputs during the negotiations. The highlight was a side event organised by Green Hope themed 'Youth Empowerment and Sustainable Consumption' where the Environment Ministers of Suriname and NIcargua spoke alongwith eminent civil society representatives from Norway, the Netherlands , Bolivia and Sweden. Green Hope believes in complementing its advocacy at UN forums with ground level engagement actions. The team conducted a sustainability workshop for several hundred children of prisoners at a facility in Nairobi. This facility also has a section for babies , whose mothers are in prison and a halfway house for teenage mothers . We carried clothes , books and stationery for the children and through an art workshop taught them about environmental conservation. We arranged for a special lunch for these children and sang and danced together , bringing some much needed joy into their lives. Thereafter the team traveled to Kisumu ( a small town on the shores of Lake Victoria) where we engaged with more than 150 young people from surrounding villages , teaching them about how they could contribute to the sustainable development process.We planted several trees as a symbolic green statement at both workshops. Clean water storage is a major issue for these children and they also don't have electricity. So we donated water storage containers and solar lamps which would help to meet their basic needs. Green Hope's mission is to bridge the opportunity gap by empowering the world's most marginalised children in the sustainable development process and our workshops in Nairobi and Kisumu helped to empower over 500 such young people , turning them into local eco-warriors who pledged to make a difference in their communities.